Add a taste of autumn to your beverage service with these Bigelow cranberry apple herb tea bags! This flavor of Bigelow herb tea brings a perfect balance of fruity and floral flavors. Though this Bigelow herb tea is naturally caffeine-free, it is made from an invigorating blend of hibiscus, apples, rose hips, chamomile, and cranberry. When brewed, it develops a deep ruby red color and a refreshingly sweet and fruity aroma. Allow your guests to relax and unwind with a cup of this crisp and slightly tart cranberry apple flavored tea that's great for any occasion! This Bigelow cranberry apple herb tea tastes great and is a great quality! It is exactly the same brand you would find in grocery stores but there is a better selection on here. The tart flavor of cranberry combines with the sweetness of apple for the perfect combination. Drink it hot or cold, it's the perfect drink for morning, noon, or night. Bigelow teas are a quality tasting tea! The customers love this brand and every flavor I have sold in the cafe has been a winner. I will be trying more flavors! YUM!YUM! I keep returning to Bigelow's package, I try to avoid the big commercial brands, but I can't give up Bigelow. The flavor is rich and full. I can make a 2-cup pot, using 2 teabags, and add honey for a touch of sweet. Steep for five minutes, remove the teabags for a repeat performance later on in the day, and I'm a happy camper. The cranberry apple herb tea is delicious and makes a great tea for the fall harvest season. The tea is very fruity and very delightful. Love! I love the combination of the cranberry and apple! I add a splash of cranberry juice as sweetener. I drink this before bed because it has no caffeine. This tea is amazing! It's one of the most refreshing flavors they yet. It has the perfect blend of tartness and sweetness, no sweetener needed. This tea has a nice balance between the apple and cranberry flavors. The aroma is more “appley” than that of the cranberry. A nice refreshing tea. The Bigelow cranberry apple herb tea is so fruity and delicious. I love the great taste and the tea is perfect for our summer days. I love it iced or hot and it is perfect. 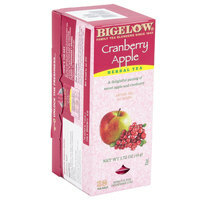 The Bigelow Cranberry Apple Herb Tea packs delicious fruity flavor and pleasant aroma all without having caffeine. Being Caffeine Free this is a good addition in our break room. Tastes great. I was expecting a spice taste because with tea, anything I've had that is apple flavor is always consisting of a strong spice taste but this one is different. It's sweet, although, I wish it was a bit more tangy as cranberries are but that's just personal preference. I had never ordered this twenty-eight pack of Bigelow Cranberry Apple Herb tea before and it has disappeared very quickly. While I stuck to the hot version of this tea, my wife went with an iced version and was just as pleased. The aroma will freshen any room with a cran-apple smell and I definitely taste the strong flavor. I would order again for certain. Bigelow Cranberry Apple Herb Tea has well-rounded flavor. If you love cranberry and apple, you would absolutely love this flavored tea. We will stock this up! The Bigelow Cranberry Apple Herb Tea has the perfect blend of cranberry and Apple to make it stand out above the other brands. It steps well and has a very pleasant aroma. I love the cranberry apple. It tastes better than juice. I am a tea lover and this is one of my all time favorites. It gets me nice and relaxed. A superb tea that would get more stars from me if I could give them. The apple and cranberry herb tea is sweet, sultry and down right delicious. It is great served hot on cool days or even cold with a spring of mint during warm months. One of the best flavors! Very sweet cranberry taste with a hint of apple and spice. No sugar is needed. The flavors are complex and authentic. It does not have the artificial taste that many other flavored tea brands have. I absolutely love this product! This herbal tea is the cranberry apple and tastes great! The cranberry and apple blend great together! This tea comes in individually wrapped tea bags that are made of foil which helps the tea stay fresh and free from air exposure. I love a combination of apple, cranberry and herbs in my tea! It's just perfect! You will enjoy this tea! Price is great too! Just perfect choice! The second that you steep the tea bag into the water your nose is treated to a fantastic aroma and then your mouth is treated to delicious tea! This Bigelow Cranberry Apple Tea is an herbal tea so it can be enjoyed all throughout the day (and night!). The taste is great. Another amazing variety of tea. Cranberry Apple is a very tasty herbal tea that is popular in my New England location. Bigelow has a great selection of both caffeine and herbal teas and this flavor is definitely great. Herbal teas are a lovely addition to have for a caffeine alternative and match well with many desserts. Another unique flavor from Bigelow! This time, its cranberry apple tea. Worth the try. The aroma is nice and soothing. We gave 4 stars. Bigelow ! Not crazy about this cranberry apple herb bigelow tea. I was hoping it would be a mixed cranberry and apple flavor, but it's more apple. was not a fan of the cranberry apple herb tea. Maybe I need to add more sugar to make the tea more tasty. Guess not all teas are great. Cranapple has become a popular flavor for juice and now it will for tea the more this one is consumed. It has a good flavor. This tea is not only aromatic, but it also tastes absolutely delicious! I swear by Bigelow brand of teas, they are the best! Great product. This tea is wonderful! Myself and my friends love it! I have ordered more flavors and I'm really excited to try them all. This one is a is very good for a fall season, so yummy and great for a tea party! Aromatic but even better- this herb tea tastes good! It actually has apple and cranberry flavor, not just smell like some teas. The taste is not as strong as a juice of course but it's very soothing and actually contains some of the antioxidants from cranberries in it. Love that you can taste the tang of the cranberry instead of covering it over with apple. On hot days, i enjoy it in yogurt or smoothies to give more health benefits and flavor. The favorite tea in our company break room. We are ready to reorder this for third time! We love the cranberry - apple flavor and the fruity taste is a real crowd pleaser. With 28 tea bags to a box, the your bottom line will appreciate the low cost. This is such a refreshing, fruity tea. It reminds me of the holidays in this comforting, cozy way. I really enjoy drinking this tea on a cold, cozy day. The cranberry Apple herb tea steeps good flavor and rich color and is easy to use for one or more cups. It is great to drink cold nor hot and is delicious. This is my favorite tea. It sells out really quickly. Unfortunately the box was damaged, so I had to display it in the old box. This tea has been the most popular flavor in our hotel. The aroma of apples and cranberries is calming and enjoyable which makes it good to drink. Dark red color and has a nice scent. Cranberry is dominate flavor. I do prefer this herbal tea to some others. Good to have as part of your tea selections. Our latest order came at 8:45 a.m. and we opened up the large box and found what my urologist said to drink just in case you run out of cranberry juices. My husband made me a cup of Bigelow Cranberry Apple Herb tea. I was floored when I tasted it. No bitter taste and it has NO CAFFEINE .The price is unbelievable . Will buy more to have for a healthy body. This tea reminds me of cold fall days. I could sit inside and drink this tea while watching the leaves fall outside. The cranberry apple pairing is wonderful and really complement each other. I'm a big fan of cranberry so this was perfect. It does taste like cranberry so that was good, more or so I didn't have to add that much sweetener because I liked the sour tang from the cranberry. The apple was there but just a hint. Our coffee shop wanted to expand our tea selection, so we ordered this cranberry apple. It is awesome! It's a great winter tea offering. Our customers liked it so much, that it's now a regular offering. Customers really like this tea - they say it's hard to find in stores. Has a tangy, cranberry taste - not a heavy tea taste. Bright red and tasty. The perfect flavored tea for the fall and winter months. The Cranberry Apple flavor is wonderful flavored and we just love it. It's very affordable too. This tea is my absolute favorite and I couldn't be happier with it! Def. getting more! Can't find it in stores anywhere, so huzzah for you guys for having it, and cheap too! I love teh Bigelow tea! The cranberry apple has a great aroma and it is perfect for fall! Steeps quickly and tastes great, I love making large batches! Bigelow Tea, Cranberry Apple Herb Tea has a nice blend of flavors. Add in Webstaurant's Organic Dutch Honey, and you have a soothing, healthy drink. This is one of my favorite teas. Another tea that seems to best be served in the fall of the year. Cranberry and apple remind me of falling leaves, pumkins, Thanksgiving and all of those wonderfall flavors of fall. I was hooked from the first time I ever tasted it in a small cafe in a small Vermont town almost three years ago. Yummy, Yummy, Yummy. This herbal tea is so soothing. It has the delicious taste of apples and the slight tang of the cranberry. It is not a really "heavy" tea so it is perfect at night after dinner. When using it to make iced tea, I double the strength.